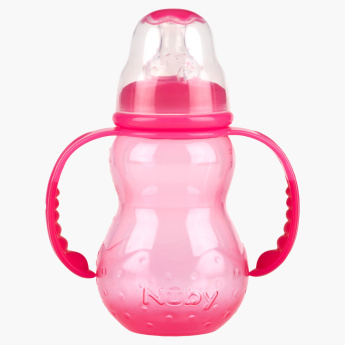 Nuby Feeding Bottle with Handle - 210 ml | Pink | Anti-colic bottles to prevent baby from gas and colic. Pick this perfect bottle to help your child transition to independent drinking. This bottle is easy to handle and to drink from. This anti-colic bottle prevents babies from gas and colic. This bottle is specially designed with the non-grip system and is highly durable.